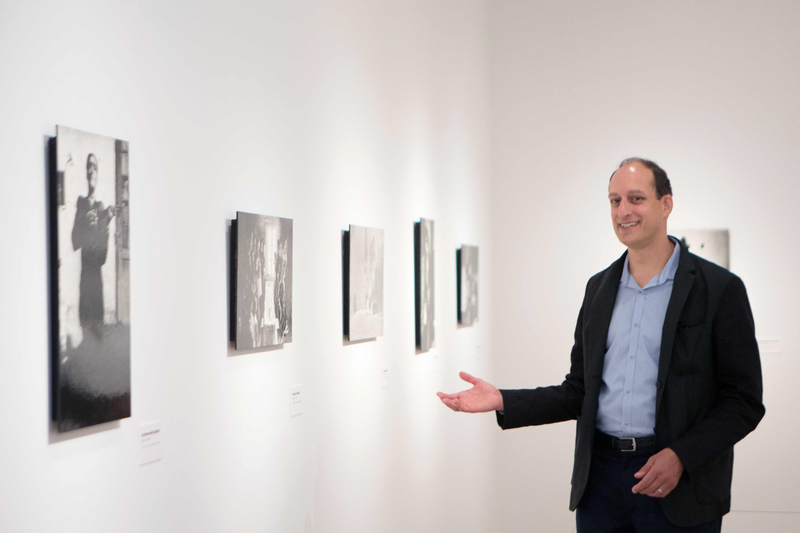 Matthew S. Witkovsky is the Richard and Ellen Sandor Chair and Curator of the Department of Photography at The Art Institute of Chicago. Q. How did you decide to become a curator specializing in photography? What brought you to the Art Institute of Chicago? Witkovsky: It’s a bit of a funny path. I first worked in the art world for Zabriskie, an American gallery with a branch in Paris. Virginia Zabriskie showed American art of an earlier period, contemporary art of every description and photographs, importantly. And so, I got interested. In 1992 I went into museum work, as the assistant on a show of work by Constantin Brancusi—a sculptor who also made a lot of photographs. I ended up preparing the photographic section of the show. In my training as an art historian, I wrote about modern art but not especially photography. In my practical work and in the art market, however, I worked in photography. After a decade of moving back and forth between departments of Modern and Contemporary Painting & Sculpture and Photography Departments at various museums—Philadelphia, New York, Washington—I took a curatorial position in the Photography department at the National Gallery of Art in 2003. Four years later, I came to the Art Institute. Q. You co-organized “Josef Koudelka: Nationality Doubtful,” the first US retrospective of this Czech-born Magnum photographer since 1988. Koudelka is perhaps most well known for his iconic images of the Soviet-led invasion of Czechoslovakia. Can you talk about photography's unique ability to capture history—these kinds of real events as they happened—and how that fits into the context of art? Witkovsky: Josef Koudelka has one series that was taken at a crucial moment in history and that is the week-long record of the Soviet-led invasion of Prague in August 1968. Koudelka has never described himself, however, as a photojournalist. He doesn’t take assignments; he doesn’t fulfill commissions; he doesn’t print his photographs above captions; he doesn’t provide a narrative to unify them. He was certainly present at this very important moment of history. Koudelka deployed nearly a decade of training in photographing in and among subjects who are moving quickly, and capturing action by being in it. He put his quick instincts in potentially unpredictable situations to excellent use. He also had a good sense for getting the word out and publicizing the invasion—the way young men with tanks and machine guns confronted men and women of the same young age who did not have any weapons. The Czechs wanted the world to know the injustice of what had happened. All of that came together at just the right time. Is this an allegory of photography’s function in history? I don’t know. But it is true that photographs can gain meaning within a lot of different systems. One of those systems is the art world, which is ever-changing but involves, at a minimum, a museum, a gallery, a critic, a teacher, an artist. Photographs can also gain meaning in other circuits: the system of the illustrated press; or nowadays blogs; crowdsourcing; and all kinds of groups that have emerged in the internet era, which are dependent on photographic images to cement their identity—think of Tumblr, Pinterest, Facebook. There are systems in art and others that are not really in art at all. In the case of Koudelka, it’s remarkable to observe with what concision he manages not only to inhabit different systems but also to define them in his work. It comes out in the form of the work, in its size, in the way it’s printed, and in the subjects of the work, which have changed over time. "It’s exciting to present an exhibition that can explain itself and also explain so much more than itself—it explains something about how images give (and gain) meaning and value in the world." Q. The Art Institute of Chicago has a wonderful photography collection, covering all the masters. Can you tell us about lesser-known artists whose work you've added to the collection, or movements you've introduced that deserve our attention? Witkovsky: The museum has been exhibiting photographs since 1900 and has been collecting photographs for nearly as long, almost inadvertently in the teens and ‘20s, then decidedly from 1949, with the gift of nearly 250 works by Alfred Stieglitz and his circle, which came from Stieglitz’s widow, Georgia O’Keeffe. Those works were made by photographers who rightly saw themselves as masters: Stieglitz, Paul Strand, Charles Sheeler, Ansel Adams. The Art Institute has a core strength in Modernist photography because of that gift and the acquisition of the Julien Levy collection. Levy was an art dealer between the wars who specialized in Surrealism and American and European photography. And so with that acquisition, we added European to American strength in the early 20th century. In the collecting that has happened since I arrived five and a half years ago, I would say there are several tendencies. One initiative that we had early on was to assemble a good group of snapshots, which we’ve now done. The printed snapshot is largely a thing of the past, long overlooked by art museums but essential to have; snapshots have given important impulses to artists and have conditioned ordinary citizens to look at images and be creative about making them. A second initiative has been in the area of conceptual art and art of the ‘60s and ‘70s, a primary area of innovation in photography that was shunned by photo curators for many years, because the artists, who were not career photographers, largely avoided making conventionally attractive prints. Photography had the great fortune of becoming its own department at the Art Institute in 1974. It was a time of emerging degree programs in photography, photo auctions and photo galleries. There was a lot to prove, and stewards of photography wanted a very straightforward form of recognition for the field. They were not about to tear it down, as the conceptual artists were taking down the far older hierarchies and institutions of fine art. It could be hard to see the value or the direction of photography’s increasing convergence with other fine arts. We’ve managed to redress that oversight a bit. We bought art by Ed Rushca, thanks to the Comer Family Foundation. We bought work by Arte Povera members, such as Giulio Paolini; key creators of Land Art, such as Dennis Oppenheim and Michael Heizer; and quite a few other works as well. In relation to that, we have also shored up holdings by the great American generation who came of age between 1975 and 1980: Cindy Sherman, James Welling, Sarah Charlesworth, Christopher Williams. All these artists made photography their primary or only form of visual art, but they all learned above all from the Conceptual Art generation that came directly before them. The third initiative, which has been the most focused, was to enlarge our holdings of Japanese post-war photography. We had no representation of this uniquely important movement in world photography and world art. For more than three years, we’ve been building a collection that is now nearly 800 photographs and includes work by all the masters the world regards as historically significant. Last fall, we had a show of work by Shomei Tomatsu. The Comer Family Foundation was helpful in acquiring a great body of work by Tomatsu, who sadly died a couple of years ago. He is generally understood to be the single most important post-war photographer in Japan and one of the most important post-war figures in Japanese art. With those initiatives reaching maturity, we are focusing on surgically plugging holes across the collection; we also are starting to increase our representation of African and African-American photographers. Q. Are there future exhibitions in store that will showcase some lesser-known artists or movements? Witkovsky: To celebrate the 40th anniversary of the [Photography] department and the fifth anniversary of the Modern Wing, we have a season-long celebration called simply “Photography is __________.” It is up to you all to fill in the blank. We like to think that photography could be almost anything. If there is a purpose to having a department that concentrates attention on that nearly unbounded possibility, it’s only to underscore how diverse and varied the world is; and certainly, how incompatibly varied the collections in an art museum can be. An encyclopedic museum such as ours has folk art, Greek art, contemporary art, decorative art. It has great examples of everything that humanity calls art--but what “art” means, in such disparate areas of human endeavor, is limitless. Picking up on that theme, the season is deliberately mixed and varied in what it presents. Work from all the recent acquisition initiatives will be on display—African-American, Japanese, Conceptual, snapshots. On display will also be a collection of Eastern European pieces that I brought in when I first started but which are now housed in several other departments. A private collector named Bob Leibowits had assembled an incredible history of Modernism mostly through printed materials, with a large concentration on the photographic—books, magazine, posters, decorative arts. He would have advertising photographs made of a porcelain dinner service, for example, and then he would have the porcelain, too. As a result of all those different objects, Leibowits’ collection now resides with Architecture & Design, Prints & Drawings, the Library mostly, and a little in Photography. As part of the “Photography is ” season, we are hanging the very best of what we’ve acquired over the last five years throughout our Allerton building galleries. On one 45-foot wall, we are going to hang 66 Modernist works chock-a-block. These will include books and posters from the Leibowits collection, amateur snapshots, icons of Constructivism and Surrealism, and direct political works such as election posters. One theme will be, simply, how many forms a photograph can take. Another will be the combination of radical politics and a radical exploration of the human body: Hans Bellmer’s Doll, happenings in people’s apartments in Nazi Czechoslovakia, wild and rebellious behavior in front of or with the camera. The range and the mix should open things up. From 1889 to 1989, you can see a century of European and American and Japanese and African-American makers working with the camera in all kinds of ways. The “Photography is” emphasis comes off the walls to extend to the programming around what is on those walls. We have a slew of pop-up talks planned, short talks given on one piece at a time by all sorts of museum staff: our intellectual property manager, our CEO, fellow curators in other departments—anyone who has specific knowledge to bring to a given photograph. We’re working with a fashion designer, a history professor, photographers and others in town as well. That’s just one set of events. The website is also a huge part of the programming. We’ll post online all our writing on these many works, archive links to stuff we’ve created for past shows, a special app for the Modernism wall and more. There will also be evening events, a series of artist lectures with Laurie Simmons, Jim Welling, Wolfgang Tillmans and others. The idea is to be as vibrant as we can be, to be as open as we can be and to get people excited about learning about photographs—as a way to learn about art in general and its modern history and to be more aware of the image world around us. "Photography is not its own world, but a way through the world." Q. Do you have new ideas about working with other departments in the museum to expand our view of artistic movements and provide context for the work while crossing traditional lines of media, such as painting, sculpture, drawing and film? Witkovsky: The Art Institute is generally a collaborative place. This department has organized more than one show with several other curatorial departments. Photography does have unique strengths in its range of address. We are not kept to a specific time period, like Contemporary Art, nor a geographic region, like Europe or America. Nor are we exclusively a fine-arts department. Here we can treat high and low culture, work made nearby and very far away, and also [work from] now and long ago—1839, the best-known founding date for photography, is by now almost two centuries in the past. All of those variables should be kept in play for the benefit of the most diverse possible public. I don’t welcome an increasingly heavy focus on the “now,” which is a problem not limited to the cultural sector. I think it’s really important to go through life with a historical dimension, to know something of what humanity has achieved before our own time. Also, we are a local museum with an international reach. It’s great that we can pursue that combined local/international mission departmentally. Finally, it’s good to remember the importance of the vernacular. Of course fine art is our core mission. What’s great about photography is that it often draws on the vernacular to enliven the world of art, which can quickly become closed in on itself. That, too, is not only a problem in art—it’s a problem for America in general; it’s a problem in our political class. It’s the bubble that everyone talks about. There are bubbles everywhere. In a fully professionalized society, we’d have nothing but bubbles. It’s really good to be able to open up to the non-specialist, non-professional. If you put a bunch of amateur snapshots on a wall, you instantly get that. Q. Photography feels more alive and accessible than at any point in its history. We hear and we feel that "Everybody is a photographer." We'd love to hear your thoughts on this. Witkovsky: Working in photography—as an artist, as a curator, as a writer—one has to deal with the question of the multitude. That’s a question for culture in general. There are always a zillion photographs. That goes as well for a lot of other areas. The multitude is important; the multitude is scary; the multitude is life itself. It defines modern society to be sure. For the last couple of centuries, people have been able to get around enough to see that there are a lot of people in the world. For the last century, the awareness of the billions on the planet is very widespread, shall we say. That has translated into an image world that now numbers in the quadrillions. "What we do with knowledge of the multitude is a big question. We can run from it; we can soak in it; we can critique it in a certain way." Any one person’s function is limited. The ability of one institution to handle the multitude is limited. But it can be suggested, and probably in consideration of what any one person’s brain can handle, suggesting would be the best approach. To deal with it statistically would overwhelm us in a nanosecond. Photography as a field gives a good way to address that issue, which is not a problem per se, but it’s certainly a situation that is definitional for modernity. You can address it and you are prompted to address it in a regular way, in a way that in other areas of art you might not be so prompted to address it. Everyone thinks about the multitude in some way, I would guess, almost every day. Our interview with Matt Witkovsky was conducted on July 31, 2014.